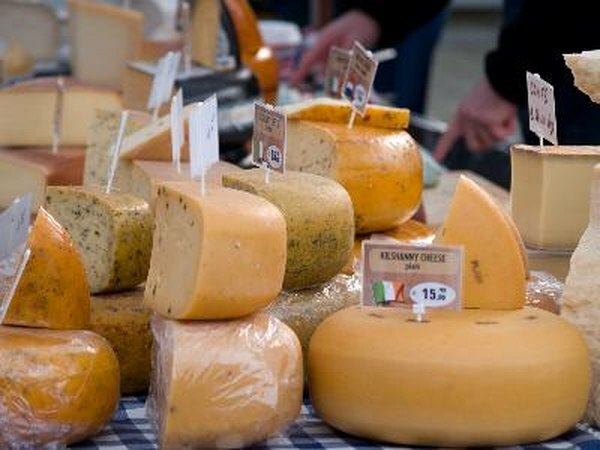 Healthy cheeses are rich sources of protein, calcium, amino acids, vitamin D and other important minerals. While many cheeses are high in fat, low-fat or reduced-fat cheeses are healthy choices that allow you to add many different healthy cheese options into your daily nutritional plan. Neufchatel is light cream cheese. It is a lower-fat alternative to regular cream cheese. Neufchatel cream cheese has 70 calories per 1-oz. serving. Neufchatel cheese also contains 2 g of protein, 1g carbohydrate, 6 g fat and 2 percent of your recommended daily allowance of calcium. Mozzarella cheese made from part-skim milk has only 72 calories per 1-oz. serving. It is packed with 6.88 g of protein, 4.5 g of fat, less than 1 g of carbohydrate and 222 mg calcium. Part-skim mozzarella also contains various minerals, including 7 mg magnesium, 131 mg phosphorus, 24 mg potassium, 175 mg sodium, .78 mg zinc, 4.1 mg selenium, 136 international units of vitamin A and 4.4 mg choline. In addition, it is rich in vitamins, including .23 mcg of vitamin B-12, 12 mcg beta carotene and 35 mcg retinol, according to the U.S. Department of Agriculture’s Nutrient Database. Low-fat ricotta cheese is good with fruit, mixed with other ingredients and stuffed into pasta. A 1/4 cup serving of low-fat ricotta cheese contains 50 calories, 2 g fat, 4 g carbohydrates, 2 percent RDA of vitamin A, 2 percent RDA of vitamin C, 15 percent RDA of calcium and 1 g of fiber. Feta cheese is made from sheep milk or a mixture of sheep and goat milk. Most feta cheeses are soft, but some feta comes in a partially hard form. A 1-oz. serving of feta cheese contains 75 calories, 6 g fat, 1 g carbohydrate, 140 mg of calcium, 96 mg phosphorus, 18 mg potassium, 316 mg sodium and 120 IU of vitamin A.
Cottage cheese is a favorite of dieters because it is low in calories and blends well with fruit, vegetables and other foods. It is an abundant source of bone-building protein and calcium. One cup of low-fat, 1 percent milk-fat cottage cheese contains 163 calories, 28 g of protein, 138 mg of calcium, 11 mg magnesium, 303 mg phosphorus, 194 mg potassium, 918 mg sodium, 39 mg choline and 93 IU of vitamin A.